This study intended to establish the effect of internal control systems on financial management in Baringo County government in Kenya. Internal control systems are integral components of the management processes of a public sector institution which should be established in order to provide reasonable assurance that the financial operations are carried out transparently and accountably. The study adopted the Committee of Sponsoring Organizations of the Tread way Commission (COSO) theoretical framework for analysis of internal control systems. According to COSO framework, the internal control system is analyzed using five variables namely; control environment, control activities, risk assessment, information and communication and monitoring. The research concluded that control activities and monitoring of information communication technology, significantly influences financial management as indicated by these analysis; (F=5.836, p = 000). Control activities (â = .315, p = 0.045) and ICS monitoring (â = .432, p = 0.049) significantly predict changes in financial management, while control environment (â = .162, p = 0.186) and information and communication (â = .264, p = 0.128) does not significantly predict changes in financial management. These research findings will be of significance to the Kenyan government in formulating policies related to efficient use of government resources. The findings will also be of significance to Baringo County in strengthening its internal control systems to enhance accountability and improve on financial management. Keywords : Internal control system, control evironment, control actities, monitoring, information and communication. ISNAD Lagat, Cornelius , Okelo, Caroline . "EFFECT OF INTERNAL CONTROL SYSTEMS ON FINANCIAL MANAGEMENT IN BARINGO COUNTY GOVERNMENT, KENYA". Journal of Economics Finance and Accounting 3 / 1 (April 2016): -. 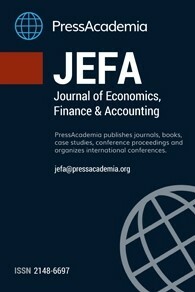 Journal of Economics, Finance and Accounting (JEFA) is a scientific, academic, peer-reviewed, quarterly and open-access online journal. The journal publishes four issues a year. The issuing months are March, June, September and December. The publication languages of the Journal are English and Turkish. JEFA aims to provide a research source for all practitioners, policy makers, professionals and researchers working in the area of economics, finance, accounting and auditing. The editor in chief of JEFA invites all manuscripts that cover theoretical and/or applied researches on topics related to the interest areas of the Journal. JEFA publishes academic research studies only. Ethics Policy - JEFA applies the standards of Committee on Publication Ethics (COPE). JEFA is committed to the academic community ensuring ethics and quality of manuscripts in publications. Plagiarism is strictly forbidden and the manuscripts found to be plagiarised will not be accepted or if published will be removed from the publication.